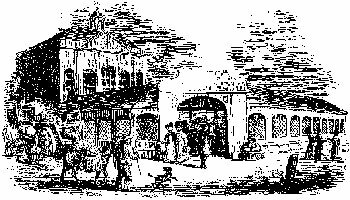 The engraving above shows the old Margate Market Place that was built in 1820 on the site of the previous Market of 1777, which had been erected on the area then known as the Pier Green. The earliest recorded date of a Market in the town is 1631, during the reign of King Charles the First. The ground plan of the Market building was that of a triangle, its narrow end at the North of the site sprang off from the new hall built against the Old Town Hall (these two buildings now house the Margate Museum). The three colonnades of the new Market were supported on the street side by brick arches and internally by cast iron columns. It was served by four arched entrances and was immensely popular and successful. A description in Kidds' 'Picturesque Pocket Companion' of 1830, from where the engraving is reproduced, says that 'perhaps there are very few markets in the kingdom better supplied with both the necessaries and luxuries of life'. The Market was restored in 1874 and the appearance of the area further enhanced by the planting of trees. In the mid 1890s, it was decided to install a new Police Station under the Town Hall and erect new Municipal Offices on the site of the Market. This was made possible by the gift of funds for the project by Martha Hannah Kendal who sponsored the building, opened in 1898, as a memorial to her late husband, Alderman Daniel Kendal, who served the Council of the Borough of Margate for 21 years. The new Municipal Buildings were joined to the Old Town Hall by the curious overhead bridge style corridor still there today. At the South end of the new building was a small Market, now the Citizen's Advice Bureau and Tea Stall.